I like my iPhone 7, but big screens pose a reachability problem. Apple even has a mechanism within iOS called Reachability, where lightly tapping the home button twice slides the entire UI down, so the oft-on-top navigation elements are easier to hit. After several years of large iPhones, designers like Max Rudberg are starting to explore moving key UI elements to the bottom of the screen. This is good, because I like making common UI elements easier to reach, and I’m pro- anything that stops me from tempting fate and gravity whenever I’m trying to walk and tap the top-left of my iPhone’s screen. So why, as Apple continues to invest in large screens, is the current iOS Springboard still a forced top-to-bottom, left-to-right layout? You want this too. Don't tell me otherwise. Allowing me to put icons anywhere on the existing grid means I don’t need to choose between a clean home screen and hackery to keep my most-used apps within reach. This isn’t a new idea. For years, Android has both allowed an unrestricted grid layout and put default, non-docked icons near the bottom of the screen. I think it’s served them well in the era of big phones. Since its introduction 10 years ago, the iOS Springboard has been largely unchanged. We got folders in iOS 4, but not much since then. If we’re to assume that the future is filled with 4.5–5.5 inch screens, I think affording users some flexibility in where their home screen icons go is worthy of consideration. Just use the Dock for your favorite apps. — I routinely use more than four apps in a given day. iOS 11’s iPad Dock almost solves this problem, but we’re talking about phones here. Springboard is restrictive, but it’s behaves consistently, which is easier for new users to learn. — Maybe, but I think whatever usability is lost would be regained quickly with a more flexible grid. 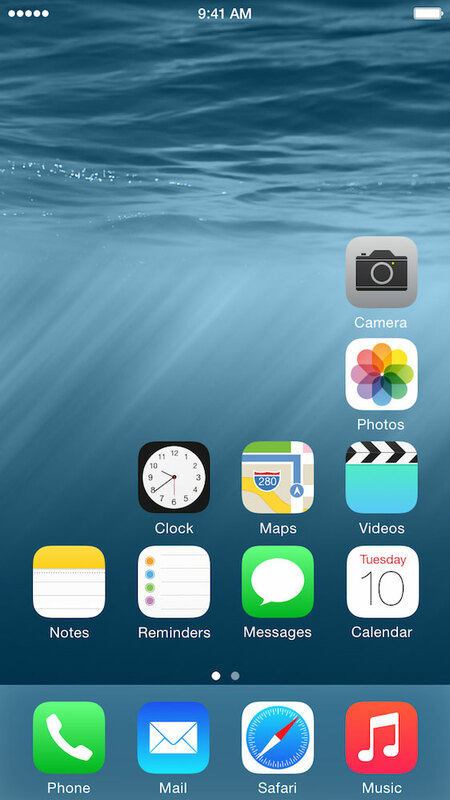 Whenever I see a screen with a top-to-bottom, left-to-right icon layout, my mind immediately thinks of iOS. Why would Apple ditch that free branding? — Don’t worry, I hear the iPhone X notch is super identifiable. That’s what we’ll all be using next year, right? Reachability works well enough, and it’s system-wide. — Reachability isn’t the answer, it’s a band-aid to make our current navigation-on-the-top state less annoying. Have comments or questions of your own? Let me know.